No one really likes Formula One’s halo, meant to prevent driver head injuries. Nine of the 10 teams voted against the halo as well, per sources who spoke with Autosport. It’s being pushed forward on safety grounds, regardless. Even though it’s a half-baked solution that still leaves too much open space for small-but-still-dangerous chunks of debris to hit a driver’s helmet, and it’s ugly to boot. 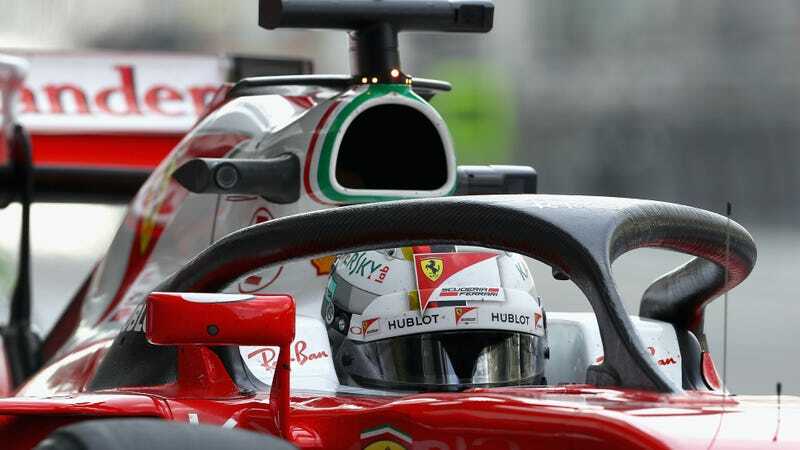 The halo was pushed through at a meeting of the Formula One Strategy Group in Geneva, where representatives of all 10 teams were on hand to give input on the matter. While F1 went with the halo anyway, not all of their feedback fell on deaf ears. The FIA vowed to work on improving the design of the halo, Autosport notes, suggesting that aesthetics were a concern. Given that Ferrari has been doing much of the testing of these new devices and that the halo was originally Mercedes’ idea, it seems a solid bet that one of F1's two most powerful teams was the lone “yes” vote. The FIA insists that F1 pick some kind of head protection device by 2018, despite all of their waffling around on the matter. To that effect, the halo is better than nothing. But when Formula One claims to be the highest level of motorsport in the world, they should to do better than “sure, fine, whatever, this, I guess” as an answer to a vital safety concern. Hopefully this big push for cockpit safety goes better than the last. F1 previously mandated that teams run the halo in 2017, right before going back on that decision ahead of this year as they claimed the halo needed more testing. The halo and the shield were the only two solutions being tested out by F1 at the moment, so the halo won by default. Every team has tried the halo out since 2016 and it’s been tested extensively by now, while the shield has been tested out once and made Sebastian Vettel dizzy in its current form. One promising thing to note is that all 1o teams were in the room to give input on the halo. This shouldn’t be a revolutionary idea on a vital piece of safety kit, but for F1, it is. F1's Strategy Group usually consists of F1's five most powerful teams—Red Bull, Mercedes, Ferrari, Williams, and McLaren—plus the highest-finishing other team in Force India. F1's new ownership seems to realize that this is bad, as these teams routinely vote only in their own self-interests and ignore the newer teams on the grid. So, the other four F1 teams were brought in to give input, even if they couldn’t lend a formal vote for or against anything. The Strategy Group also discussed cost controls and ways to improve the show for for fans, Autosport notes, so having smaller teams who run on more precarious budgets in the room was a good call.